The 2018 4 Nations Cup comes to a close this afternoon in Saskatoon, Sask., with Finland and Sweden playing for third place at 3 p.m. CST and the United States and Canada facing off for gold at 8 p.m. CST. No big surprises there, as that’s the way this tournament nearly always shakes out, but it makes for two good rematches between rivals. As an aside, it’s been a strange tournament for everyone with a stomach bug going around, but the Finns’ losses have been markedly worse than just missing a few players for a game each. They’ve been without Michelle Karvinen and Susanna Tapani for the entire tournament, and while they’re still a strong squad, they’re nowhere near full strength without those two creating offense. Still, in their preliminary round match-up against the Swedes, Finland jumped out to a 3-0 lead early on, with a 19-8 edge in shots in the first period alone. The Finns held on for the win, but two late goals from Sweden with an extra attacker on made things really interesting. One of those goals came from Hanna Olsson, who has looked good when I’ve watched her in this tournament. Emma Nordin has also been a top player for Sweden, and I think if they can get that line rolling, they’ve got a good chance in this one. Getting off to a good start will be key for the Swedes in this one; if they can keep the Finns off the board in the first period and jump ahead themselves, they’ll force Finland’s hand a bit in terms of offense. One area where the absence of Karvinen and Tapani is really hurting Finland is the power play. They went 1-for-4 on the power play in their game against Sweden but that’s been their only PP goal this tournament. It was especially frustrating for the Finns last night; they had four straight power-play chances in the first and second periods to score and cut into Canada’s 2-0 lead, but came up empty-handed. So, taking advantage of those opportunities to get their offense rolling will be a key for them in today’s game. We’ve seen strong performances from Emma Nuutinen and Riikka Välilä so far this week and I’d expect them to make an impact today. We’ll get another classic match-up between the two favorites with a gold medal on the line. It’s hard to say exactly what to expect, but games between these two seem to always come down to the wire, either in overtime or late in the third period. We saw that on Wednesday night, when Sydney Brodt broke a 1-1 tie with 1:38 to play to help the U.S. to victory. Brodt has been a big contributor to Team USA, with a team-leading three goals plus an assist in this tournament. Fellow rookie Melissa Samoskevich has settled in really nicely as well, and scored her first goal against Sweden yesterday afternoon. Not surprisingly, Hilary Knight is leading the team in scoring with five points (one goal, four assists), and her line with Hannah Brandt and Dani Cameranesi has looked strong all week. While Canada had an underwhelming start against Team USA in their first game, they settled in after that and only yielded the one goal until Brodt scored (off a wacky bounce, too) in the third. I think the team as a whole showed much more of their potential last night against Finland. Brianne Jenner made a welcome return to the line-up, their D cut down on turnovers, and they stifled Finland in terms of possession all game. 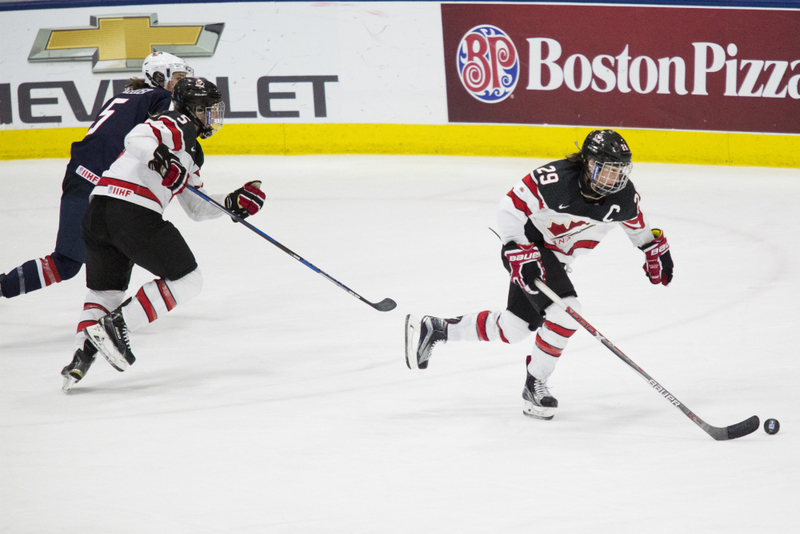 The line of Marie-Philip Poulin, Mélodie Daoust, and Rebecca Johnston has been the best at this tournament, but Canada needs to count on more offense than that to beat the Americans. I’ve liked Natalie Spooner, Sarah Fillier, and Sarah Nurse together, and I think that group can step up more in terms of production. Special teams figure to be a big factor in this one, as they typically are in tight games. Canada’s penalty kill looked really good against Finland last night, and the U.S. hasn’t given up a power-play goal all tournament. In fact, neither team scored on the power play in their preliminary round game. If one of them can break through in this game, it could give them a big edge.